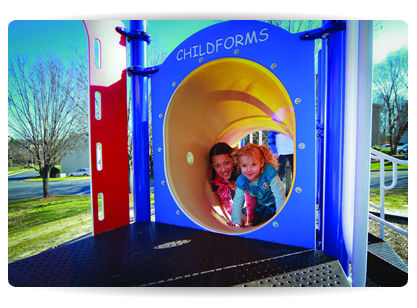 Our HOA Playground Structures are designed to fit the specific needs of children. Childforms offers different variations of playgrounds for ages 2 to 5, 5 to 12, or together 2 to 12 years of age perfect for any neighborhood. Our playground structures may include the following equipment: slides, tunnels, balance beams, and even a zip line. Each of our playground structures can be custom fitted with faith based panels to represent the church. Contact us today and let us guide you in making a great investment for your organization. We use commercial grade components engineered to resist corrosion, fading, and mildew so your playground will last. Featuring a post and clamp system because it’s the most flexible and simplest installation method available, and it reduces the risk of rust from drilling the poles like a direct bolt system. Available in multiple color combinations so you can find the right playground for you.